There are useful things that I like to make purely for the pleasure of it, to have just what we want at a higher quality than one can buy, and to enjoy the thing knowing it’s homemade. Sauerkraut goes a step further, being so strikingly economical. As a health food, it succeeds in making me feel better immediately upon eating it. I love that it will balance stomach acid, whether you’ve too little or too much, but mostly I just love to eat it. 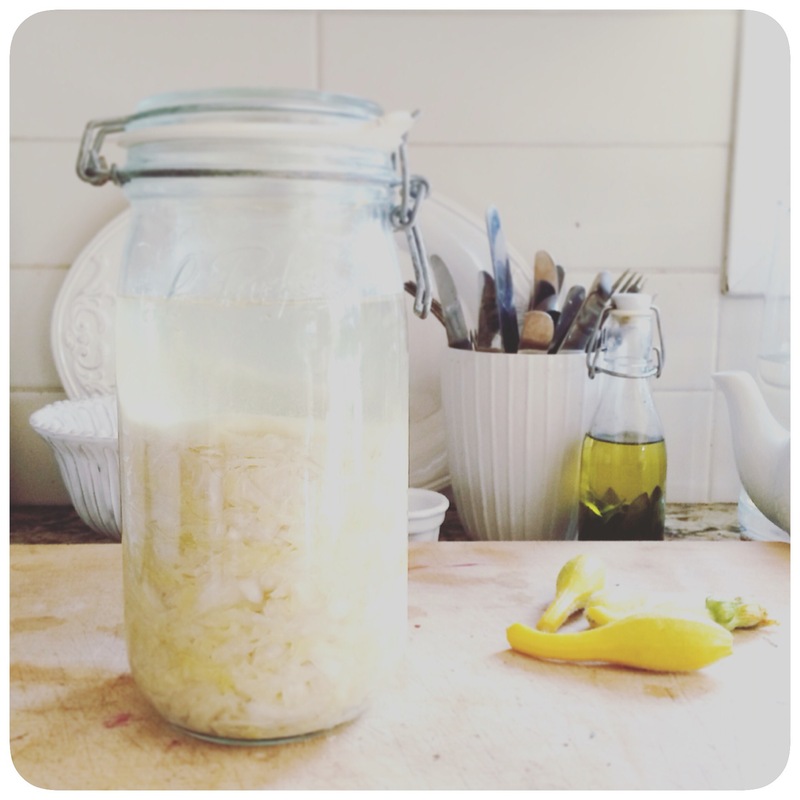 I figure that fermenting sauerkraut is worthy of becoming a habit for life. Here’s how I’ve been making it. Begin with a cabbage, sea salt, and a very clean, very strong glass kilner jar, (we like Le Parfait or Fido), with a rubber seal. 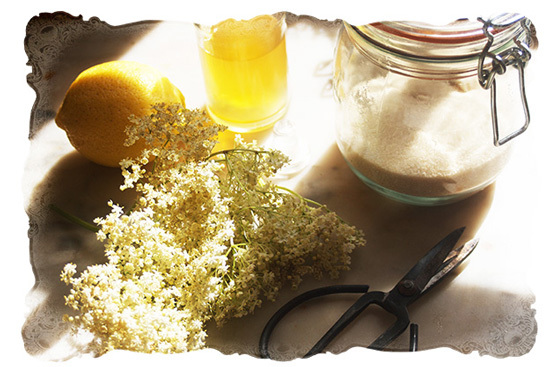 A small clean glass jar is useful later, too. 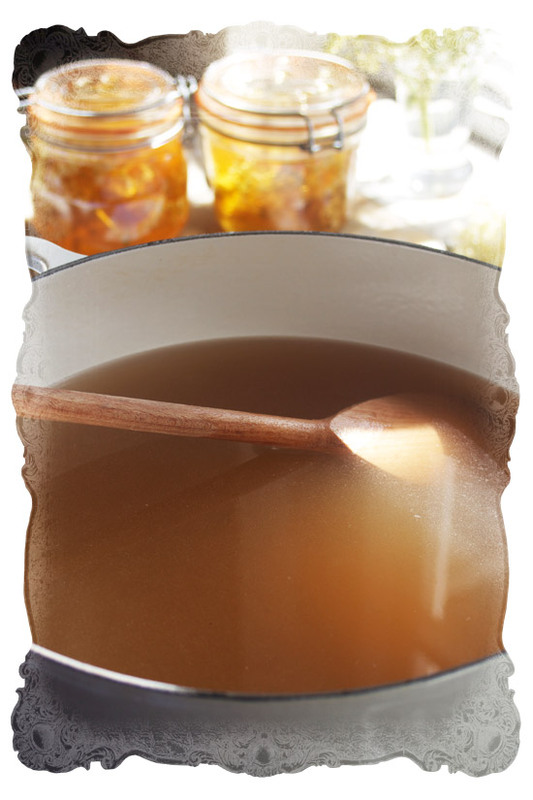 If you’ve got it, ½ cup of brine reserved from a live storebought kraut will jumpstart the process. All set? Weigh the cabbage. Ours was conveniently a full kilogram. 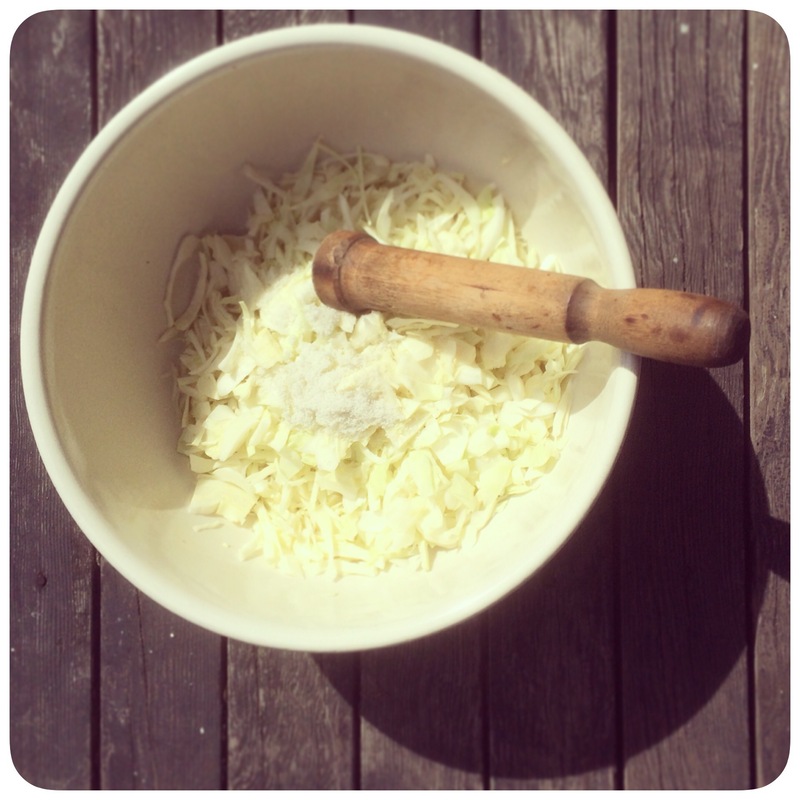 Reserving a nice big leaf, slice the cabbage as finely as you like it (or grate it on a traditional kraut grater if you’re lucky to have one!) and throw it in a clean, sturdy bowl with the salt sprinkled over, and the kraut brine starter added if you have it. I like to be sure to hone my blade, now there’s a useful skill, before slicing and during, too. Now, bash it. We found this old muddler at a favourite antique shop, how easy would it be to turn one on a pole lathe! It works brilliantly – but the flat end of a handle-less rolling pin or similar object you find around would function. We like making kraut with friends, taking turns having a bash. The goal is to see a good deal of liquid emerge from the cabbage. Sometimes we leave somewhat muddled kraut under a towel and plate overnight to get the juices flowing, depending on what the day is like. 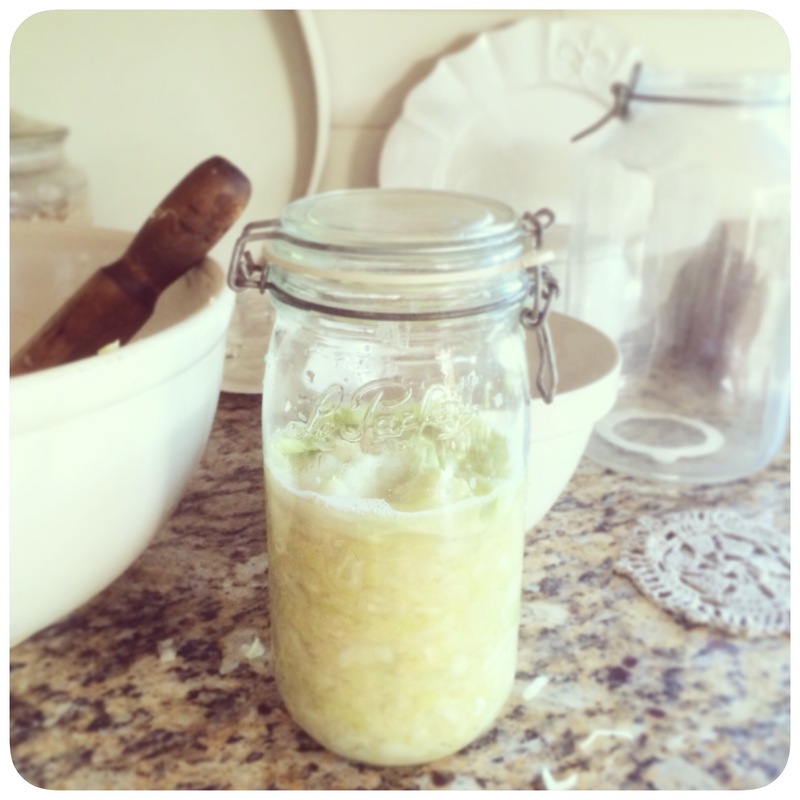 When you pack the cut, bashed cabbage firmly into a clean, strong kilner jar, you want to see enough liquid to submerge the cabbage. Don’t worry, you can add more brine later if necessary, depending on the type and the age of the cabbage. 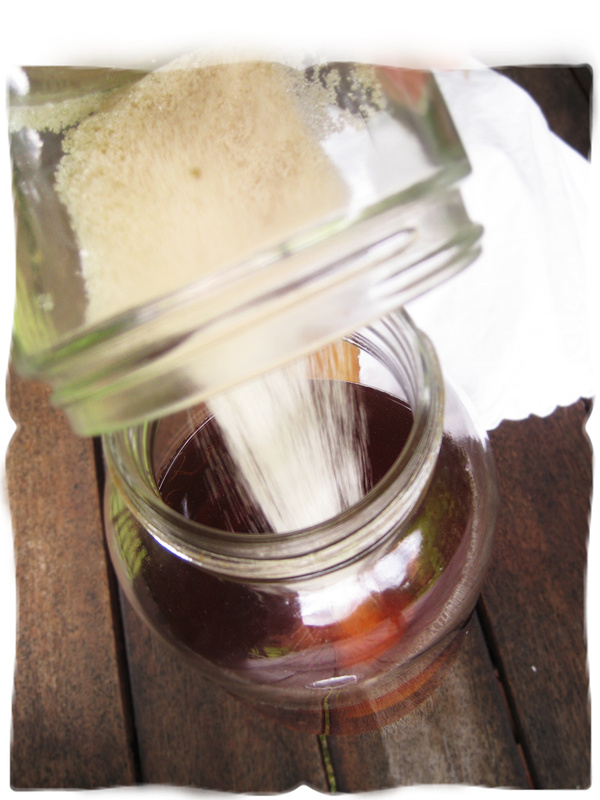 To make brine, mix water to salt at 2.5% or so – or follow the simple traditional rule our friends the Bairds over at Ecosense use – salt it to taste like the ocean! Tuck the cabbage leaf that you saved all round the top of the chopped stuff, putting it to bed so nothing is floating, nothing exposed to air. Place a small clean jar or glass with some water in it inside the large jar, to weigh down the big leaf, and close the large jar up tight. A dark cupboard will be an ideal place for the sauerkraut to live while it ferments. 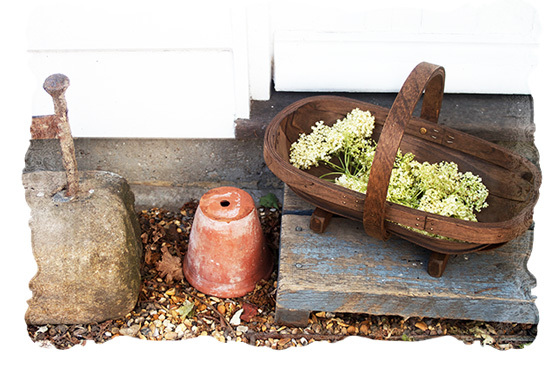 In a while – my friend waited a few days while I waited two weeks – open it, pull back the cabbage bedding, and sample your wares. Tuck it back in and leave it be if it isn’t ready. When you figure it has fermented to your liking, eat it. I move it to the fridge -some folks say there’s more probiotic action before refrigeration, and some folks are a little nervous of things like this and trust the fridge- and use it up in your own good time. This time I shall set a reminder to make some more before we run out! 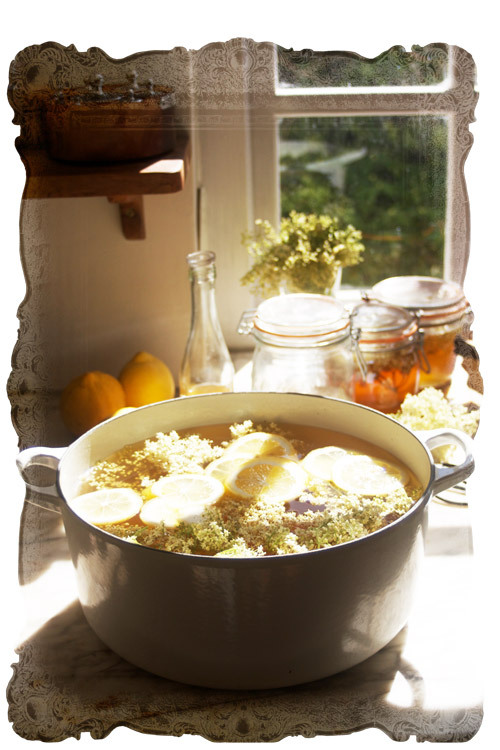 Ben Hewitt of the wonderful book Nourishing Homestead makes a ton of it in jars and stores it cool all year. We are very much impressed with the flavour. The texture of this batch was a shade crunchy for the smaller folk, so the verdict is to try a different cabbage, and experiment with how thinly to cut the veg. 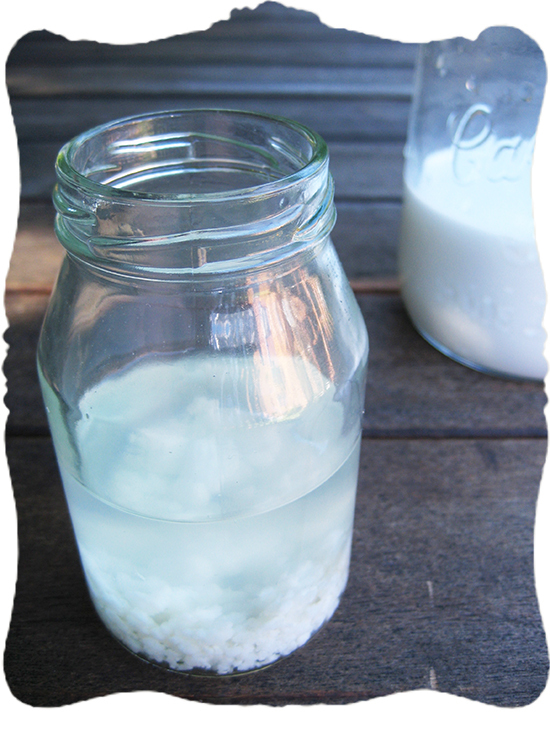 No mold, no burping the jar, no airlock required, no special crock, nothing to do but be patient. 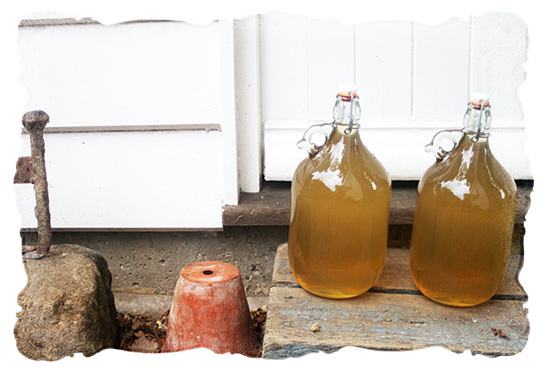 We like Sandor Katz and Pascal Baudar for great writing on fermentation, and tremendous ideas on what else to ferment. Ah yes, you’ve caught us. 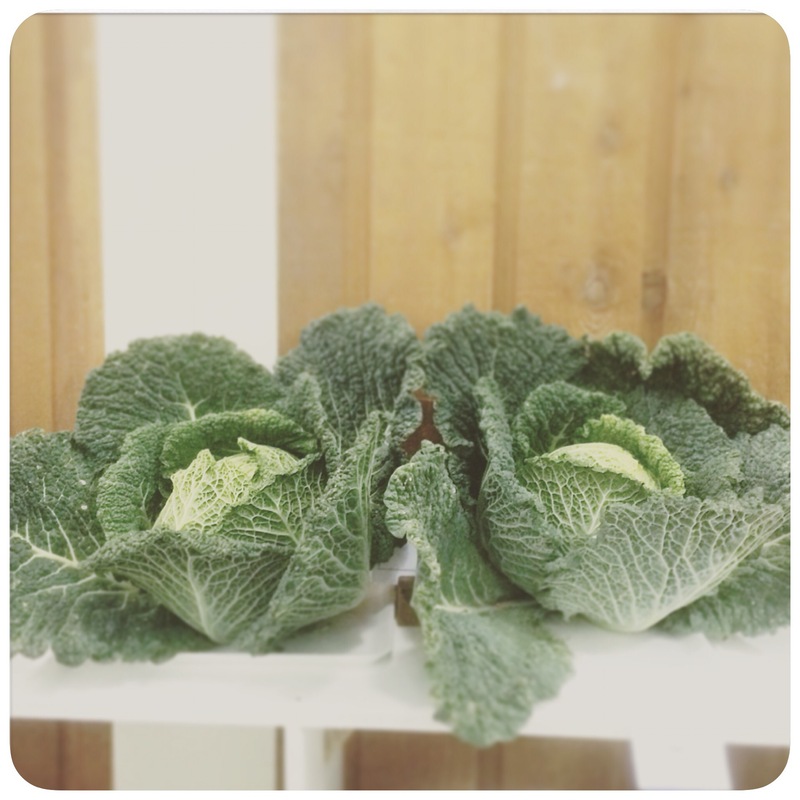 Now we’re eyeing other people’s prize cabbages, and plotting to grow our own kraut-cabbage. Before I lived with my sweetheart, I lived with a dear friend from art school, in the oldest neighbourhood in Vancouver. Years of beautiful meals and conversations around the built-in table. It had a pipe running through it, we painted it silver. I went to visit Jen in another gorgeous old flat across the city, and we fell into our familiar habit of talking about art and ideas around a very similar table. 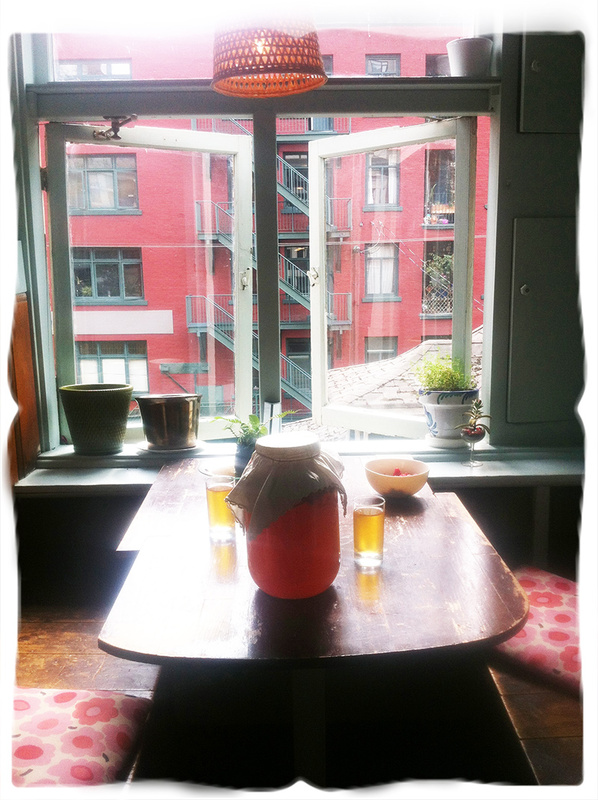 Over kombucha! 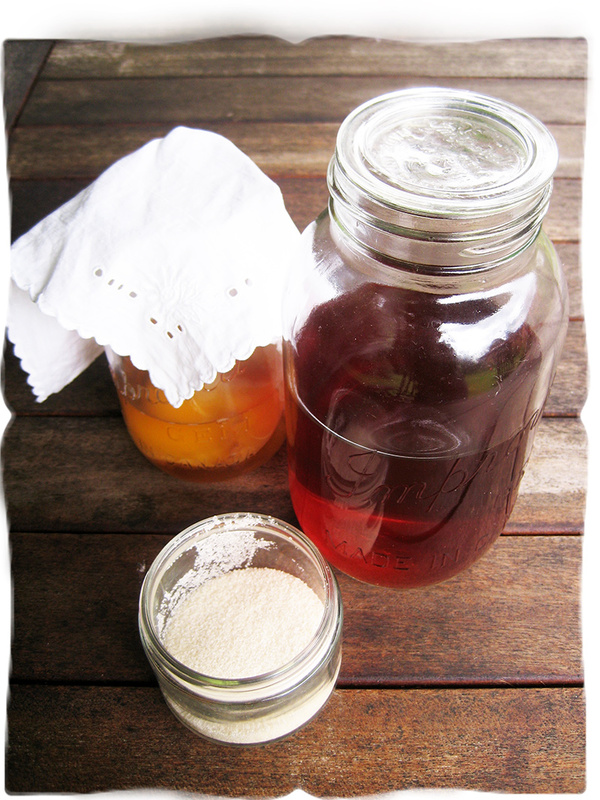 Sparkly, fermented sweet tea, good for digestion and detoxification and full of nutrients and probiotics. Otherwise known as the immortal elixir. 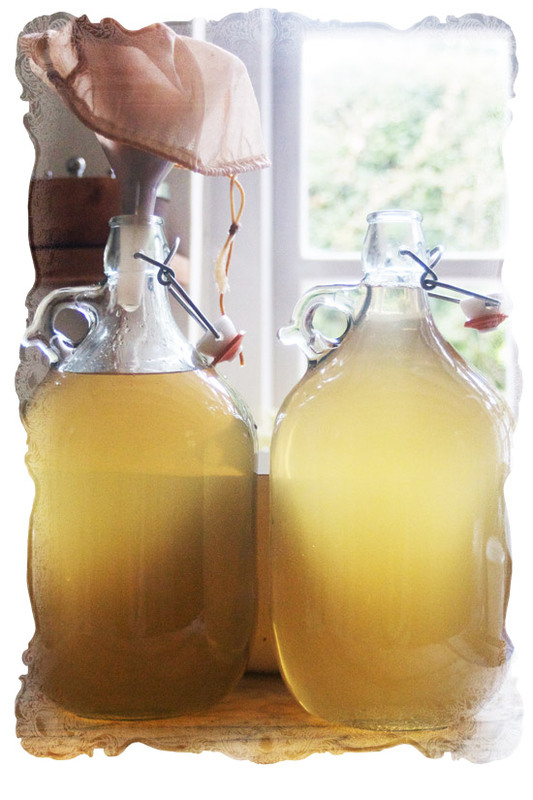 Kombucha originated two thousand years ago somewhere in the Far East, spreading throughout Russia and all over the world, and arriving, belatedly, in my own kitchen. Jen sent me home with a bit of the zoogleat mat, the symbiotic bacteria and yeast, the scoby. 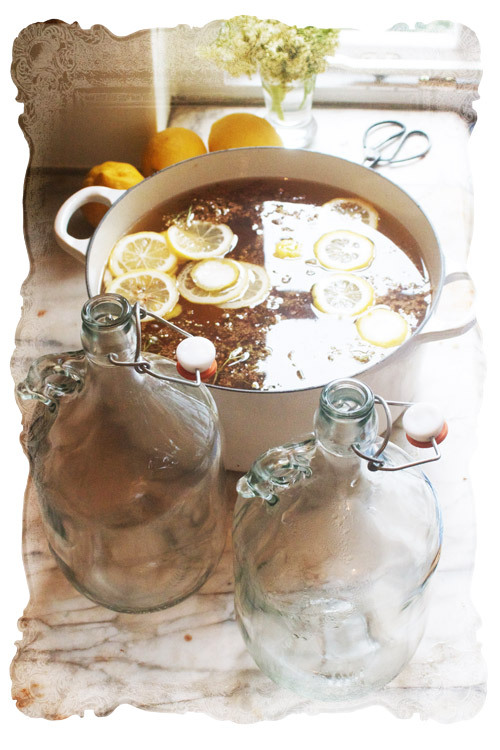 Like my homemade vinegar, it has a mother culture. So I’ve begun. I brewed strong black tea, and let it cool. Perhaps next time I’ll stir the sugar in while it is hotter, oops. This part is very real. 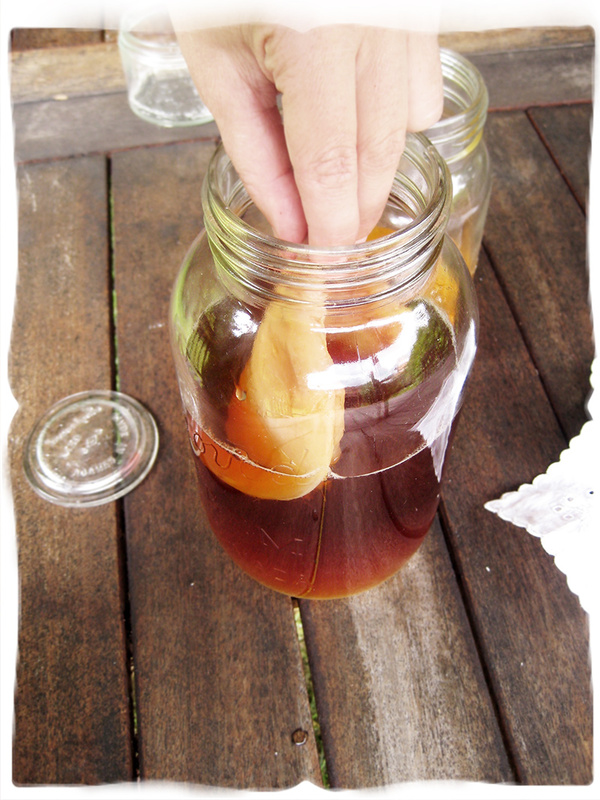 Pull the mother out of the kombucha and add it to the fresh, cooled tea. Science project! I’ve been thinking that there’s something steadying in nurturing these kinds of fermentations, sourdough culture, cream cheese, yogurt, such that even if one’s life isn’t particularly full of routine and ritual, order and awareness, it becomes more so by taking this up. Almost as if an older way of being is intrinsic to the slow food, and the slow food influences my life towards a little more peacefulness, rather than requiring a peaceful life before beginning to make the food. Not that I haven’t forgotten yogurt for a few unintentional hours in the airing cupboard on more than one occasion. 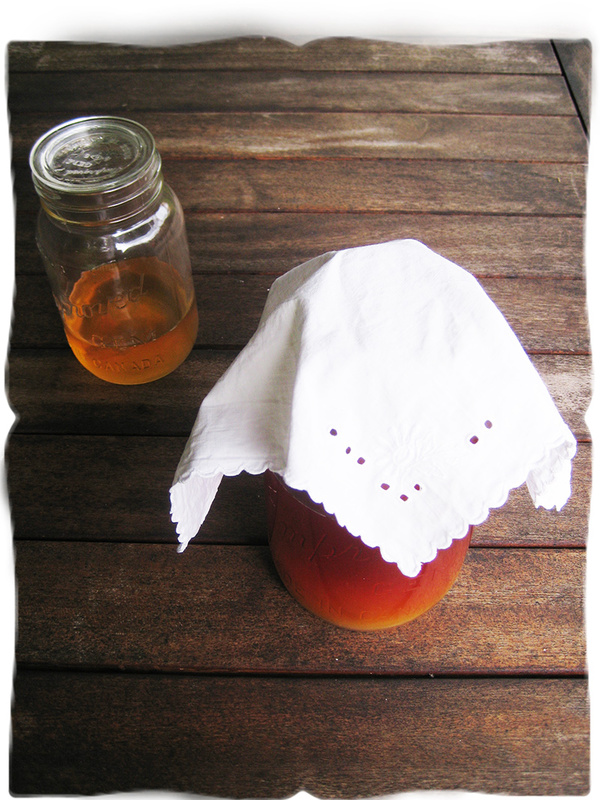 p>Cover with a clean cloth to allow it to breathe while staying clean, put it in a dark place for about a week, and then taste it. 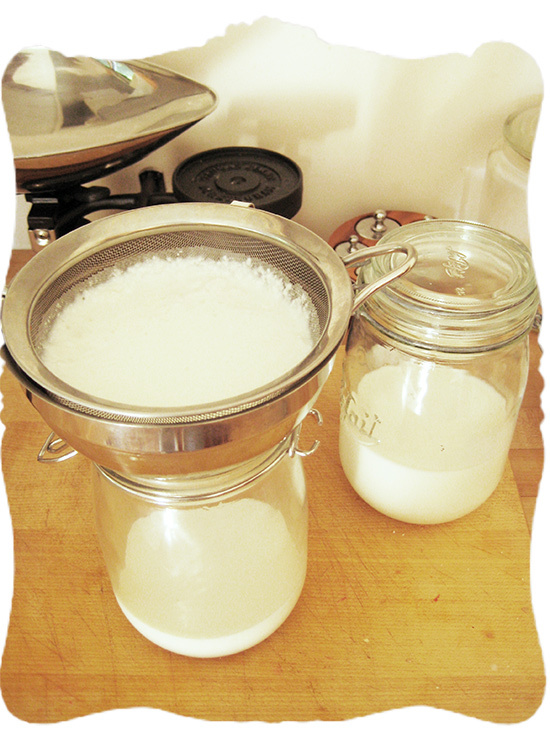 When its ready, begin again, nurturing the new relationship, like the ones you might have feeding the sourdough starter and the yogurt culture. Devoted. I’m so excited. I’ve got the last batch of kombucha in the fridge, to drink, and live forever. If not, Jen’s given me another route to immortality, or at least better digestion, which do seem to be intimately connected. Naming your sourdough culture like a pet may a seem a little odd, but I’m hoping that it means we won’t forget to feed it. (I’ve set a reminder on the calendar just in case we neglect it anyway.) The children measured a cup of flour (we used whole spelt but will use rye in future, it works better) and a cup of warm water, into the jar, and stirred it. Take your time stirring in, as lots of air is a very good idea; the wild cultures are in the air around you. Tomorrow, and the next day, and possibly a dozen after that, we’ll feed the culture: we’ll toss out half (better yet, use it in baking, or pancakes!) and add half a cup of flour and the same or a little less in water. If brown liquid appears it isn’t such a good sign, but you can pour a little off or stir it in if it is dry, and plan to feed the culture more often for a bit. (A professional baker later told me you can feed it twice a day!) You want a scent like a fine beer brewing, rather than something going off, if you see what I mean. When the culture starts to bubble, and is doubling in size, it is beginning to be ready, but could ideally use a couple of weeks of daily feeding. The best ritual is when you are removing half of it to bake with, and feeding the other half a little when you do, but for the home baker sometimes that isn’t possible. 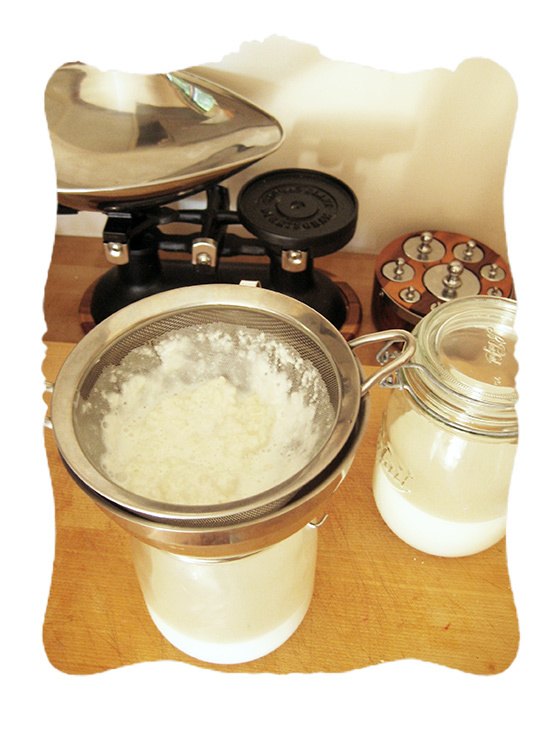 Better to culture and use a sourdough starter imperfectly than not at all, I say. After a couple of weeks, we’ll feed it every day if we are using it often; if not, it goes into the fridge to be fed once a week, and brought out and fed daily to get it back up to an energetic bubble again. Soon we can use it to start our first traditional slow sourdough. If we are really devoted, we can use this culture for our whole lives. The children named the wild sourdough culture Flower. 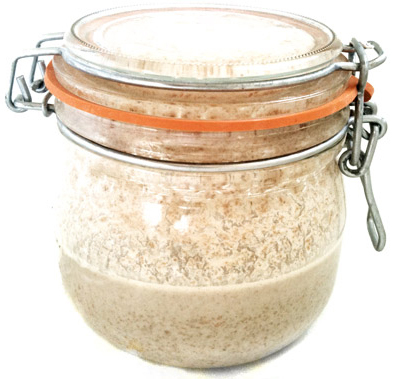 p>Read more about sourdough culture over here, as I get more experienced with it!